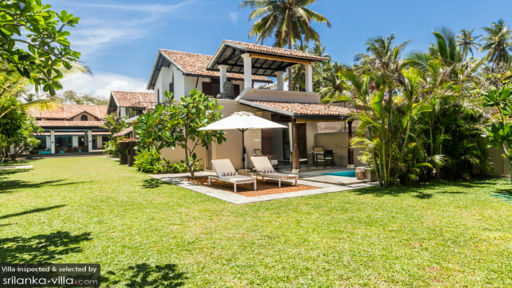 The Muse at Taru Villas is a nine-bedroom tropical paradise found in the coastal town of Bentota, Sri Lanka. 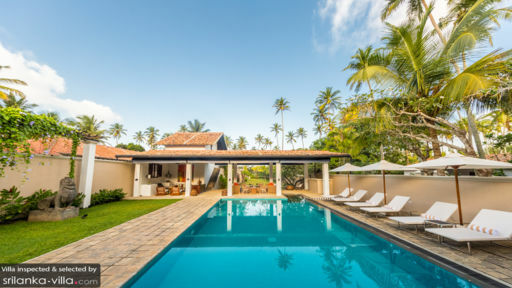 Located in the beautiful and scenic Galle district, the stunning property defines itself as a boutique hotel featuring contemporary architecture marked with traditional Sri Lankan décor. Manicured gardens flush with vegetation and natural greenery will greet you upon your arrival with towering palm trees and the tropical sun peeking through the leaves is sure to make you feel at peace! The Muse boasts of nine, fully-furnished and air-conditioned bedrooms, of which five are standard rooms, and four are deluxe bedrooms. All the bedrooms are adjoined to a balcony or terrace which is furnished with chairs from where you can view the gardens. Each bedroom is furnished with a king-sized bed, cable TV, mini-fridge, and safe. There are en-suite bathrooms with necessary amenities for your convenience as well. The bedrooms are decorated with artwork that inspires and soothes at the same time. Crucial for a restful night’s sleep, the comfortable setting is only heightened by the bright colors and the natural light from the windows. The beautifully-landscaped swimming pool outdoors along with the verdant gardens brings a cheerful disposition to the entire area. As you lie back on the sunbeds found on the timber pool deck, you can nap under the large parasols, or sunbathe to get working on your holiday tan. 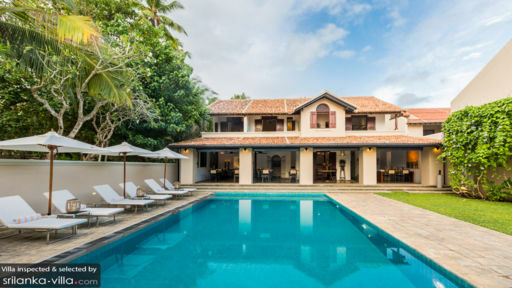 The gardens are furnished with outdoor chairs, where guests of the villa can enjoy a cup of tea or some breakfast as they relish the tranquility and the refreshing air of Bentota. With gorgeous scenery right at your feet, what more but the sound of leaves rustling in the wind, and the cool waters of the pool to dip your toes in! The living area at The Muse, is the poolside pavilion which is essentially open-plan to allow the fresh breeze and naturally sunlight to flood the room. With an extensively designed ceiling fitted with fans, the living pavilion is furnished with comfortable and island-inspired furniture made from jute and white upholstery accented by bright orange cushions for a cheerful ambiance. There are armchairs as well, upon which guests can lounge as they gaze at the beautiful scenery. The walls are decorated with Sri Lankan art, featuring colorful aesthetics and a vibrant theme. The dining pavilion at the villa is nothing short of a seaside restaurant with a splendid view of the pool, since the pavilion is open-plan. There are several two-seater dining tables for guests to have their meals with their loved ones. Overhead the antique fans keep the room cool and breezy coupled with the fresh air from outdoors. The kitchen is fully-equipped with modern amenities, ready for service! There is a TV lounge for guests’ recreation complete with books and board games. The villa staff offers extensive services to guests including daily housekeeping, in-house laundry service, and if requested, massage therapies at the onsite spa rooms. The staff can even arrange excursions to several key places in the Galle district for guests! Bentota is one of the most popular towns in Sri Lanka with stunning views of the Indian Ocean, and since it is located in the Galle District, guests are free to explore the UNESCO World Heritage Site, Galle Fort. Galapota Temple is another must-see sight near the villa. Indulge in watersports like jet skiing, water skiing, and banana boat rides for a fun day out on the lake. Learn more about the turtle preservation project at the Turtle Hatcheries and visit the Sri Lanka’s national park on the Yala Safari.